The reinvention of Deerfoot is also the reinvention of retail in Calgary. This 80-acre site will be transformed into an open-air destination with a stunning landscaped restaurant campus, a modern social hub and a retail experience for every aspect of your life. A full calendar of events and celebrations will bring Deerfoot City to life, creating a vibrant, exciting social experience. The journey of transformation is underway; the destination is Deerfoot City. As the redevelopment continues, Deerfoot City’s social zones will be brought to life, bringing Calgary closer to the vibrant, urban experiences that will change its retail landscape. NOW OPEN: The Food Lodge offers a central place to retreat, refuel and warm up by the fireplace. Now leasing. An eclectic collection of shops and services with everything from emerging upstart designers and homegrown labels to celebrated names in international fashion. Now leasing. Experience an exciting new destination to dine with everything from fine dining to quick casual bites. Vibrant patios will spill on to sidewalks, surrounding the event-filled central plaza and its magnificent water fountain. Now leasing. 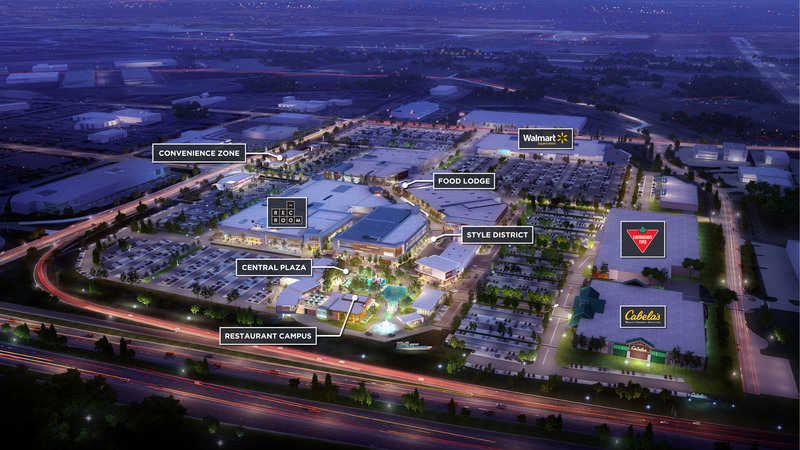 Stunning architecture, vibrant patios, and lush landscapes surrounding a dramatic water feature will create a social heart for Deerfoot City and an ideal setting for lively events and entertainment.